Wednesday, October 17th, 2018. Posted by Owen Lewis. Dave joins us fresh from his PhD at Queen Mary University of London to work on the mosquito food web project. 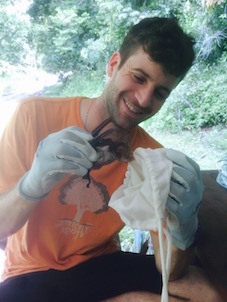 His PhD work used DNA metabarcoding to study the diet and network ecology of insectivorous bats in different habitat types in Malaysian Borneo and to reconstruct trophic networks. This work formed part of the LOMBOK consortium‘s research investigating biodiversity and biogeochemistry in human-modified tropical forests. To find out more, take a look at Dave’s personal web site or follow him on Twitter.